So I found this pic along with this post on 2chan. Don't know how accurate it is. 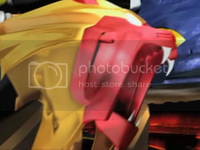 "The vinyl material used to maek Ryuki, Knight, and Zolda's suit only come in Ryuki's red, Knight/Ryuki Blank's navy blue, and Zolda's green. The molded parts come off easily, so it really stands out. The other black suits that are used are apparently cheaper. 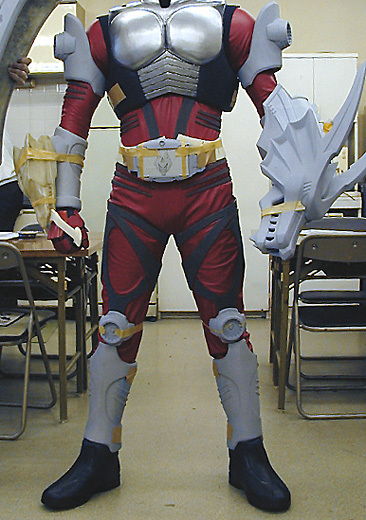 Surive, Ouja, and later Odin and the movie Riders are Kuuga and Agito's wet suits. Guest Riders and Alternative use Agito Burning Form's latex." Cool to know those trivia. The suit looks a bit dark, but probably because of the light.